I am very easily persuaded when it comes to baking. Last Sunday Brandon suggested that I bake cookies or brownies for dessert and I immediately agreed that it was a fabulous idea. I started flipping through cookbooks to find a new recipe that I could blog about and I’m here to say that I found a winner. I love the Southern Living Cookbook. It’s one of those cookbooks that never fails me…I can always find something delicious to make from it. 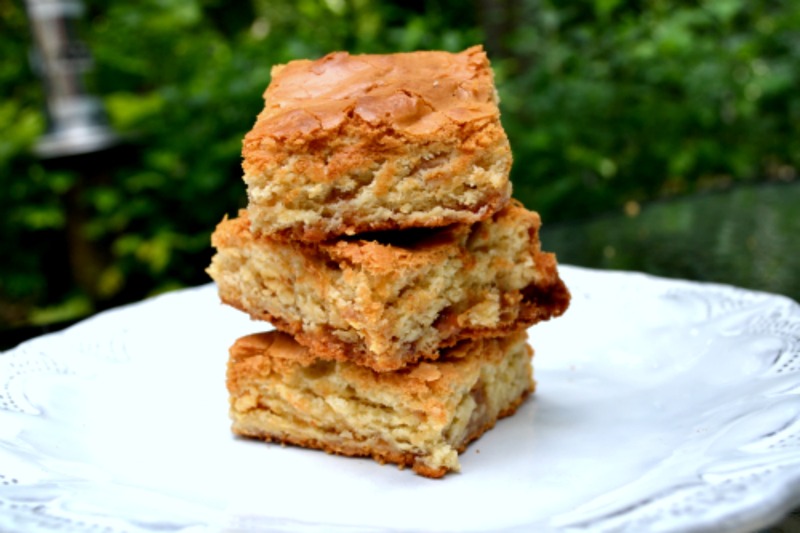 The second I saw these white chocolate brownies, I knew that I’d found my dessert. Brownies are a staple in our dessert rotation but always in the traditional chocolate form. I loved the idea of having a white chocolate base. Brandon had the genius idea of adding toffee. The results were perfect – the white chocolate was the star and the toffee added the perfect compliment. I loved the slight saltiness that the toffee provided. Top with ice cream and chocolate sauce for extra deliciousness! Preheat oven to 350 degrees and grease and 8 x 8 pan. Melt butter in a small saucepan over low heat. Add 4 ounces of white chocolate and remove from heat. Do not stir the butter and chocolate. Allow chocolate to slowly melt. Beat eggs at medium speed with an electric mixer until thick and pale, about 1-2 minutes. Slowly add the sugar, beating well. In a separate bowl, whisk together flour, baking powder and salt. Gradually add to egg mixer, mixing until just blended. Stir in white chocolate and vanilla. Fold in remaining chopped white chocolate and toffee. Pour mixture into prepared pan and bake for 30-35 minutes. Off to the internet I went in search of a recipe. 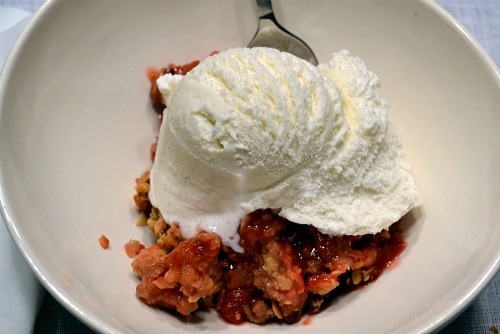 I was surprised to find that strawberry crisp recipes were scarce. Most involved the addition of rhubarb, which I was not interested in. So I did what any food blogger with an idea in their head would do, combined a couple of recipes to create exactly what I was looking for. The results were wonderful! The strawberries were warm and sweet with a nice consistency and the topping was a great combination of a buttery oat mixture with toasted pecans. We took the crisp to a friend’s house for a dinner party and it was a huge hit. And just as I expected, it was even better with a scoop of vanilla ice cream. Don’t miss out on this one while strawberries are in season! Butter an 8 x 8 baking dish or small oval baker. Preheat oven to 325 degrees. Mix together strawberries, sugar, lemon juice and cornstarch. Set aside. Whisk together flour, brown sugar, cinnamon and salt in medium bowl. Add butter and mix in with your fingertips until mixture sticks together in clumps. Stir in oats and nuts. 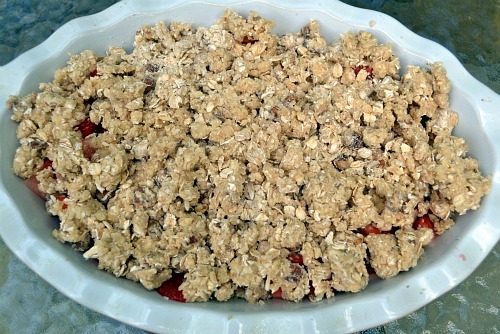 Place strawberry mixture in prepared baking dish and crumble topping over. 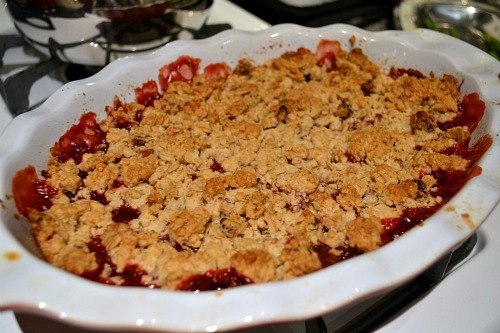 Bake for 40-50 minutes or until topping is browned and strawberries are bubbly. I was flipping through the March issue of Southern Living and came across this recipe for Lemon Coconut Pound Cake. I just happened to have all of the ingredients on hand in my kitchen so 10 minutes later I found myself baking. I had the cake in the oven in less than 15 minutes and it smelled wonderful while it was baking. I was extremely pleased with both the texture and flavor of this cake. Sometimes pound cakes can be a bit dry but this one was soft and moist. I attribute the great texture to the use of yogurt in the batter. 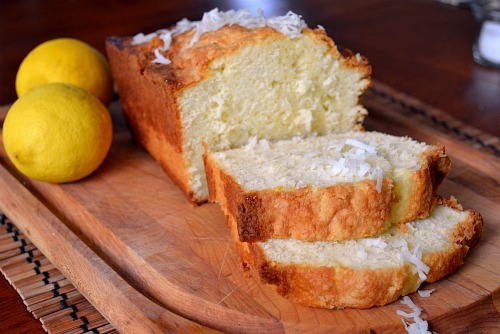 The lemon coconut flavor provided the perfect Spring twist on pound cake. We ate this plain and it was delicious but it would also be nice with a glaze or with berries and fresh whipped cream. Make this cake a must on your Spring dessert rotation! Preheat oven to 325 degrees. Butter and flour a 9 x 5 loaf pan. Stir together flour, salt, and baking soda and set aside. In a stand mixer fitted with the paddle attachment or using a hand mixer, beat butter at medium speed until creamy, about 2-3 minutes. Slowly add sugar, beating until fluffy and lightened in color. Add eggs, 1 at a time, beating just until blended after each addition. Alternate adding flour mixture and yogurt to butter mixture, beginning and ending with flour. Beat at low speed just until blended after each addition. Stir in lemon zest, lemon juice and 1/2 cup coconut. Pour batter into a greased and floured 9- x 5-inch loaf pan. Bake for 1 hour and 5 minutes to 1 hour and 15 minutes or until a long wooden pick inserted in center comes out clean. (Mine took closer to an hour and 15.) Cool in pan on a wire rack for 10 to 15 minutes and then remove from pan to wire rack, and cool completely (about 1 hour). Last week Charlotte was hit with a heavy dose of winter weather. In the South, this brings your daily routine to a screeching halt. I found myself unable to navigate my way anywhere but into the kitchen. Given the fact that I tend to keep myself insanely busy and overcommited, I have to admit that it was nice to be forced to slow down. Instead of working late and hitting the gym, I baked cookies and made a big batch of chili. 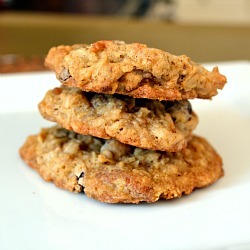 I tend to always make the same cookies – chocolate chip, oatmeal chocolate chip or oatmeal raisin. I wanted to make something new that I hadn’t baked or blogged about before. 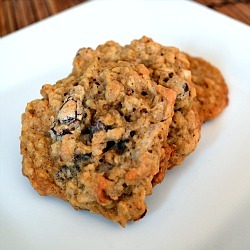 I browsed through my favorite go-to cookbook, The Gourmet Cookbook, and decided to try the Oatmeal Trail Mix Cookies. Brandon was not on board with the raisins that the recipe called for, I wasn’t on board with the shortening and I didn’t have peanuts so I made a few substitutions to the original recipe. Despite the substitutions, these cookies turned out great. One thing I was surprised to discover is that these needed to bake a little longer. I usually under bake cookies but that was not the case with this recipe. I under baked my first batch and the texture just wasn’t right. I baked the second batch a little longer and they were right on. Also, I liked these better cool than hot out of the oven. Usually we love warm cookies, and these were plenty good warm, but even more outstanding once they’d cooled. These Oatmeal Coconut Chocolate Chip Cookies are the perfect way to put a different twist on the traditional chocolate chip or oatmeal cookie recipe. In the bowl of a stand mixer fitted with the paddle attachment or in a large bowl using an electric mixer, cream the butter and sugars together on medium high speed. Beat in the egg, baking soda mixture, flour, salt and vanilla. Reduce speed to low and mix in oats, coconut, chocolate chips and pecans. Drop rounded tablespoons of the dough onto greased baking sheets about 4 inches apart and with a fork flatten and spread each mound into a round, about 3 inches in diameter. Bake the cookies in batches in the middle oven for 8 to 10 minutes, or until they are golden. Transfer to racks and let cool. I attended my first holiday cookie exchange last week and the stakes were high considering our group was made up of Charlotte-area food and healthy living bloggers. I knew that I was going to bring my tried and true Orange Cranberry White Chocolate Biscotti but I also wanted to bring something a little more Christmas-esque. 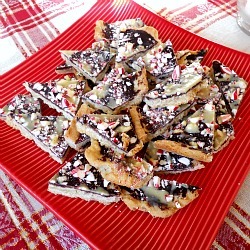 After a bit of research, I decided that these Chocolate Peppermint Bark Cookies would be perfect. 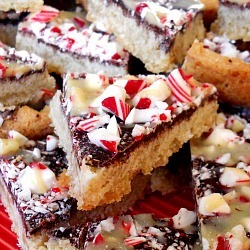 These cookies feature melted high-quality chocolate topped with crushed peppermints and a drizzle of white chocolate over a shortbread base. Although these cookies require multiple steps, they were fairly simple. I struggled most with the shortbread cookie dough. It stuck to my fingers as I tried to press it into the pan. The key to avoiding this was keeping my fingers wet with water. I was concerned that the shortbread wouldn’t cook properly but it turned out just right. The cookies were a big hit at the party and the presentation was beautiful for the holidays. This recipe will definitely be a repeat for many holiday seasons to come. I thinke these cookies would be perfect in holiday gift bags too! Preheat oven to 350 degrees. Spray a 13 x 9 inch baking pan with nonstick spray. Line bottom of pan with a long strip of 9-inch-wide parchment paper, leaving an overhang on both short sides of pan. Whisk flour and salt in medium bowl. Using a hand-held electric mixer or stand mixer fitted with the paddle attachment, beat butter in large bowl until creamy, about 2 minutes. Gradually beat in sugar and continue beating until mixture is light and fluffy, stopping occasionally to scrape down sides of bowl, about 3 minutes. Beat in vanilla, then egg yolk. Gradually add flour mixture, beating on low speed just to blend. Drop dough by tablespoonfuls into prepared baking pan, spacing evenly. Using moistened fingertips, press dough to form even layer over bottom of pan. Pierce dough all over with fork. Bake cookie base until light golden brown, slightly puffed and edges begin to come away from sides of pan, about 30 minutes. Place pan on wire rack and immediately sprinkle bittersweet chocolate over. Let stand until chocolate softens, about 3 minutes. Using a small offset spatula, spread chocolate over top of cookie in a thin even layer. 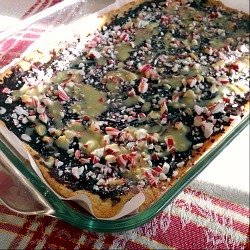 Immediately sprinkle chopped peppermint candies over. Stir white chocolate in a medium metal bowl set over saucepan of simmering water until melted and smooth. Remove from water and use a fork to drizzle the white chocolate all over cookies. Chill until white chocolate is set, about 30 minutes. Grab the paper overhang and lift from pan. Transfer to work surface and using a large knife, cut cookie into irregular pieces. First, my apologies for my recent lack of posts. I was busy running the Marine Corps Marathon! Check out my race recap on my healthy living blog. Now that marathon training is over, you can expect more regular posts. I am looking forward to spending lots of time in the kitchen this winter. Now, on to tasty treats! I don’t bake biscotti often but when I do it’s because I’m sending a package with baked goods. Biscotti holds up extremely well when shipped so I usually include it in my Operation Baking Gals packages and when I send treats to my grandmother. Biscotti is one of her favorites. Biscotti can seem a little intimidating or time consuming because there are multiple steps and you have to bake it twice but it really is a simple process. 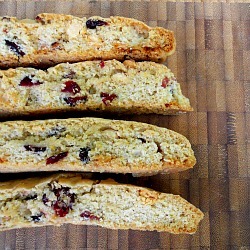 If you’ve resisted trying to make biscotti at home, give it a try! 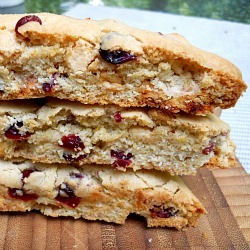 I made this Orange Cranberry White Chocolate Biscotti a few months ago and was extremely impressed. It’s definitely my favorite biscotti recipe that I’ve ever made. I shipped some of these to my grandmother but saved quite a few for myself. I baked them in the middle of the summer but I think the flavor combination would be perfect for the holidays. Preheat the oven to 350 degrees. Prepare a baking sheet with parchment paper (optional – I just used a nonstick baking sheet). Whisk together flour, baking powder and salt in a medium mixing bowl and set aside. In the bowl of an electric mixer fitted with the paddle attachment or using a hand mixer, beat together sugar, melted butter, eggs, vanilla extract and orange zest on medium-high speed until well combined. Reduce mixer speed to low and add in dry ingredients. Mix until just incorporated and then stir in white chocolate chips and dried cranberries with a spatula. Divide the dough in half. Working with one portion of dough, shape into a 12″ x 3″ rectangle on the prepared baking sheet. Repeat with the remaining dough so that the rectangles are parallel on the baking sheet. Bake until golden brown, 30 minutes. Remove from oven (leave oven on – you will need to bake the biscotti again) and let cool for 25 minutes. Carefully transfer the rectangles to a work surface and remove the parchment paper from the pan. Using a serrated knife, carefully cut into half-inch slices on the diagonal. Place slices cut side up on the baking sheet. Return to oven and bake for another 12 minutes. Transfer to a wire rack to cool completely. Store in an airtight container. Biscotti keeps for about seven days and freezes well. I wanted to bake a fall-inspired dessert the evening that I made homemade Chicken and Dumplings. I know I’ve mentioned this in several of my recent posts but I have just had a strong desire lately to spend time in my kitchen. I browsed through a fall dessert gallery on Food Network and this Pumpkin Tart with Gingersnap Crust caught my eye. First, one of my favorite fall desserts is this Pumpkin Cheesecake with Gingersnap Crust and second, I love any excuse to use my tart pan. I much prefer making tarts over pies. I was shocked to review the ingredient list and find that the tart only had six ingredients. Needless to say, it was extremely quick and easy to put together. 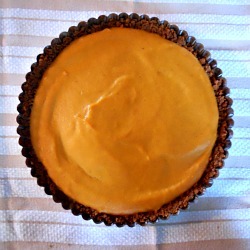 I did add some of the traditional pumpkin pie spices to the filling – I just couldn’t stop myself but many of the recipe reviews said that it was perfect just the way the recipe was written. I served the tart with homemade bourbon whipped cream and both Brandon and I agreed that it was a winner! 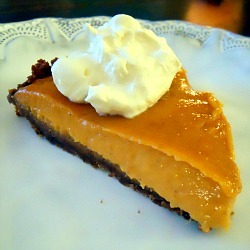 The tart is very reminiscent of pumpkin pie and would be a nice addition to Thanksgiving or holiday dessert spreads. Preheat oven to 350 degrees. Place a 9-inch tart pan with a removable bottom on a baking sheet. 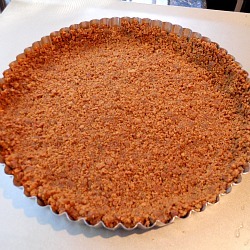 Prepare crust by combining gingersnap crumbs and melted butter in a bowl and mix until crumbs are moistened. Place crumbs in tart pan and press evenly over the bottom and sides with your fingers or a measuring cup. Bake in preheated oven until set and lightly browned, about 10-12 minutes. Remove from oven and set aside to cool. In a large bowl, whisk together pumpkin, condensed milk, egg yolks, spices and salt until well combined. Pour the filling into the cooled crust and return to oven. Bake until set and lightly browned, about 30 minutes. Remove tart from oven and allow to cool to room temperature. Chill in refrigerator at least one hour or until ready to serve. To serve, remove tart from outer ring and slice. Serve with whipped cream, if desired. I made bourbon whipped cream by beating together 1/2 cup heavy cream, 1 tablespoon of bourbon and 2 tablespoons of sugar.